Perfect for cooling indoor and outdoor spaces without cluttering homes as most stand fans do or costing users a fortune, ceiling fans are novel accessories that have caught homeowners by storm since their inception years ago. Cooling power is also admirable, while their charming designs and the add-on accessories (lights, for instance) that most models have better the experience of users further. If you are tired of the inefficient freestanding fan in your possession and are looking to replace it with an ideal indoor and outdoor model, this article has done the legwork for you. We have sifted the tens of available fans and reviewed the 10 most sought-after models. For those shopping for feature-packed indoors and outdoors ceiling fans for everyday use, 59135 Key Biscayne from Hunter Fan starts our reviews of the best in 2016. 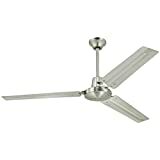 Durable, rustic, and with large 54-inch blades that move large volumes of air per revolution, its charm and functionality appeal to individuals of all cadres. All blades have well-engineered reversible technologies for warming rooms and a high-performance wind motor that delivers the needed power without noise pollution. If installed in a bedroom or living area, therefore, you do not have to worry about the annoying buzzing sound that some fans produce dampening your experience. 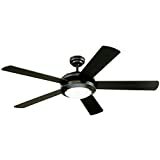 Hunter Fan 59135 Key Biscayne comes ETL rated for use in sun-rooms. It also has a versatile three-position mounting system that you can install angled or flush and an integrated light kit (14 watts) made of painted glass. 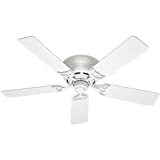 Recommended for cooling rooms measuring 20 feet by 20 feet, Hampton Bay Hugger is a high-capacity ceiling fan with an aesthetic brushed nickel construction and large 52-inch blades that roll smoothly. All blades are reversible, combo finished (maple and walnut), and draw power from a quiet multi-capacitor motor that maximizes air movement whilst cooling. You do not have to worry about noise pollution and or power issues, as is always the case with poorly designed fans. Buyers also like its frosted schoolhouse light fixture (frosted), convenient wall controls, and the durable and low maintenance technology use. Christened the Comet, Westinghouse 7801665 has helped many people all over the world to stay cool during warm summer months without spending hefty amounts of money and or compromising the outlook of their homes. With one, for instance, you get a durable 52-inch accessory with a reversible five-blade system that works well. Styling (matte black) is impeccable, while the dual-light system (frosted glass) it comes with is not only stylish but also shines brightly. This eliminates the need for drab bulbs and or light switches commonly found in homes. You also get a cold-rolled 15mm steel motor with a triple capacitor technology that dampens noise pollution, an easy to use reversible switch, a high-powered 5,199 cfm system (three speed), and warranties (two-year parts and lifetime motor). A popular line of ceiling fans, Hunter is home to many functional products with this 52090 Watson edition ranking among the most popular. Affordable, easy to install, and with a versatile five-blade design that cools efficiently, it is an excellent indoor and outdoor accessory. Blades are aesthetic, manufactured using premium walnut, and have Dust Armor coating (nanotechnology) that prevents dust build-up by up to 58%. The whisper quiet motor it comes with, on the other hand, is not only super quiet but also has an ultra-powerful design that improves air movement in homes. As most acclaimed models, you also get a versatile mounting system (three positions), a light kit with 60-watt candelabra bulbs, and a lifetime motor warranty (manufacturers). Do not waste your money on one of the underpowered freestanding fans currently available in store. 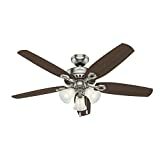 While this Fan Company 51023 Conroy ceiling fan is slightly expensive that some models, its durability, aesthetic appeal, and the high-performance system make it worth investing in. With a new one, for instance, you get large (42-inch) Onyx Bengal blades (five) each with a smooth mahogany finished body that not only lowers drag but also dust build-up (up to 58%). The light kit offered improves style and its functionality while the ultra-powerful motor it comes with is also ultra-quiet, power efficient, and has a low maintenance design that works hassle free for years. Buyers also appreciate its low profile flash mount that works best in low ceiling setups and the lifetime motor warranty offered. With Westinghouse 7861400, you get a stylish ceiling-mounted fan with an industrial-grade system that never disappoints indoors and outdoors. The three blade system (56 inches each) offered is sleek, clutter-free, and therefore, very easy to install. Finish (brushed nickel) is aesthetic and long lasting, while its advanced installation system (ball hanger) holds its weight excellently without creaking and or compromising user safety over time. With an airflow of approximately 7,105 cfm, Westinghouse 7861400 cools rooms measuring up to 360 feet. The 63-watt light kit it comes with work well while the warranties offered (2-year parts and 15 years for its motor) attest its value. 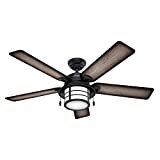 As its name suggests, this low profile edition of Hunter 53069 ceiling fan is a compact fan with numerous desirable attributes that have made it a fan favorite. Its white blades, for instance, have a contemporary allure that most individuals like. They are also large (54 inches), have aerodynamic edges that minimize drag, and have high cfm designed (reversible) that cool rooms measuring up to 485 square feet. You also get three adjustable fan speeds for customizing cooling, an exclusive motor technology that dampens noise and vibrations, and a reversible airflow technology that maximizes user comfort year round. 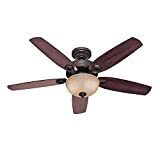 Builder Plus 53237 from Hunter is a premium 52-inch ceiling fan with a stylish swirled marble glass light and long lasting Brazilian cherry/mahogany blades. The choice of three mounting positions offered appeals to individuals of all cadres. Lighting (180-watts) is excellent, while its ability to cool spaces measuring up to 485 square feet makes it one of the best ceiling fans for use in large indoor and outdoor spaces. Hunter 53237 Builder Plus has three adjustable fan speeds, an exclusive whisper quiet motor, and warranties for both parts and its motor. 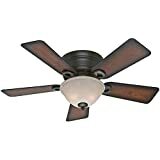 Featured among the top 10 best outdoor/indoor ceiling fans reviews for 2016 53090 Builder Deluxe is a popular ceiling fan and light kit (cased glass) combo while a high-powered five-blade design made of stained oak and Brazilian cherry. Measuring 52-inches, the blades are large and high-powered. Cooling capacity is up to 400 square feet, while the three-speed whisper quiet motor it uses is also durable and has a power efficient system that keeps power consumption low. 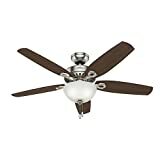 Top on our list, this five-blade 53091 Builder Deluxe ceiling fan from Hunter is a durable new bronze-themed household accessory recommended for use indoors and outdoors. It is 52-inches, appealing (stained oak/cherry), and illuminates spaces well courtesy of the 60-watt candelabra motors it uses. Operation is simple (pull chain). The reverse-capable motor it uses, on the other hand, performs excellently all year round.